On Thursday evening, minority students at Wake Forest gathered to discuss their experiences with racism, and their frustrations with how they are treated -- on campus and off. During the forum, some students said that they felt unwelcome in part because they found a photo of the dean of admissions, Martha Allman (in the very front of the photo at the top of this article). The photo is from the 1982 edition of the yearbook, and Allman is posing with members of the Kappa Alpha fraternity, which has been known for its love of traditions of the (white) South. Some students at the forum said that that the photo indicated racism that should disqualify Allman from her job. Some held signs showing the photo and calling for her resignation. In the video at left, the discussion of Allman starts around minute 47. Allman issued an apology  Thursday night for the photograph, but asked to be judged by more than that one image. "I write to you today to acknowledge and apologize for perpetuating harm," she said. "That flag was a symbol of pain and racism then just as it is now, and I understand that much differently in 2019 than I did in 1982. Thirty-seven years of life, experiences, relationships and education have made a difference in my way of understanding the world and my ability to empathize with those who are different from me. Throughout my career in admissions, one of my goals has been to create a more diverse and inclusive Wake Forest. It is my hope that I will be judged by my professional dedication to Wake Forest, my faith and civic involvement, and by my future work with the Wake Forest community." When Allman graduated from Wake Forest and became an admissions counselor, nonwhite enrollment was 6 percent. When she took over as admissions dean in 2001, the figure was 12 percent. By the fall of 2018, the figure was 30 percent. On Saturday, photos (at right) circulated of an associate dean of admissions, Kevin Pittard, who was a member of the fraternity when he was at Wake Forest, in yearbook photos with the Confederate flag. Pittard, in an email to Inside Higher Ed, said, "I apologize and express my deep regret for taking part in those photos. I made a mistake that hurt and angered others, and I should have known better. I know that, in my years in the admissions office, I have worked steadily to increase the diversity of our community and I will continue to do so. " Some black student leaders are calling for Allman to step down. Donnecia Brown, a graduate student, said that Wake Forest can only apologize by making the institution more inclusive than it is, and listening to why black students were so appalled by the photograph. "Premature forgiveness maintains the illusion of reconciliation," she said. In the debates in the last month over yearbook photos that show racist images, Kappa Alpha has featured prominently. The fraternity is known for its reverence for Robert E. Lee  and its tradition (abandoned officially only in 2010) of holding "Old South" parties and parades featuring Confederate uniforms and costumes. 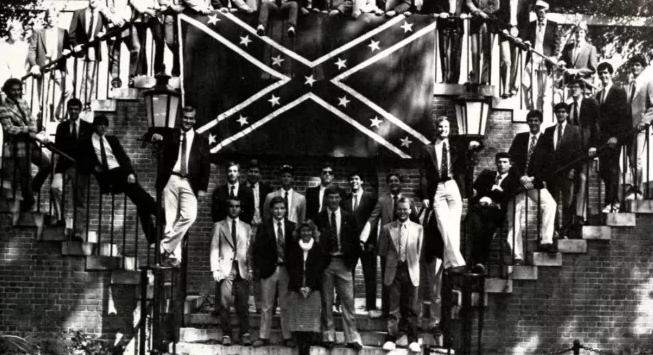 Tennessee governor Bill Lee recently said he regretted appearing in a Confederate uniform  in Kappa Alpha parties, photographs of which have since circulated, when he was an undergraduate at Auburn University in the 1970s. In 2016, the chapter at Tulane University became the source of controversy when it built a "wall" around its fraternity house and added President Trump's slogan "Make America Great Again" to the wall (at left). Many of the controversies over yearbook photos are about the conduct of politicians. Wake Forest's situation concerns admissions leaders. Allman is generally considered to have been successful at promoting efforts to diversify the Wake student body. And she has been a major proponent of test-optional admissions at Wake, a policy that has attracted more minority applicants than in the past. Joseph Soares, a professor of sociology at Wake Forest, is the author of The Power of Privilege  (Stanford University Press), which examines the role of social class in helping wealthy students get into elite colleges. In that book, and in other writing, he has urged colleges to go test optional in admissions, arguing that such policies will attract black and Latino students who might otherwise not apply. His research played a key role in Wake Forest's decision to become test optional, and he worked closely on the issue with Allman. "The Martha Allman I know is not the same person who could in 1982 stand in front of a Confederate flag; today, Martha knows that flag is a symbol of hate, not heritage," said Soares via email. "When she learned that, in the years after her undergraduate experience -- an experience that must not have included much of an education in diversity -- I do not know. But the Martha I know is someone who has done as much, or more, than anyone else at Wake Forest to welcome racial and social class diversity into Wake as our admissions dean, not least by helping to lead the leap in 2009 to test-optional admissions. Martha knows that SAT/ACT tests are biased against blacks and Hispanics, and her record in crafting a more diverse undergraduate community at Wake speaks for itself." At the same time, Soares said, the controversy points to the need to reflect on the role of Kappa Alpha and parts of the university and its history that are exclusionary. "The Kappa Alpha Order still exists on campus and it hasn’t, to my knowledge, apologized for or repudiated its hero worship of R. E. Lee, a brutal slave master, white supremacist, and military leader of the slave master’s rebellion against the United States. For our community to have no place for racism, we need a public reckoning with our college’s past, and it is for our students and faculty of color to decide whether or not that reckoning has been accomplished." The contact listed for the Kappa Alpha chapter at Wake Forest did not respond to an email with questions about the chapter today. Admissions leaders in higher education are generally strong supporters of efforts to attract more minority students. At meetings of the National Association for College Admission Counseling, numerous sessions are held on diversity-related topics. But in a much-discussed keynote speech at NACAC's 2017 annual meeting , Shaun R. Harper, a professor at the University of Southern California's school of education and executive director for the university's Race and Equity Center, said the admissions profession was too white and needed to consider the ramifications of that reality. Ted Thornhill, assistant professor of sociology at Florida Gulf Coast University, has done research on the attitudes of admissions officers  about black students, and found that many are not welcoming of black applicants who seek to be activists. Thornhill said he was skeptical of those in higher education or politics whose photos from their college days are now emerging. If they all have truly repudiated their past actions, he said, they would have spoken about these photographs years ago, not just now when they are becoming public. And the right to forgive, he said, is not one for university leaders to have. "Antiracist whites would not require public exposure of their past involvements with racist organizations," Thornhill said via email. "They would have already publicly shared this information in the process of becoming an antiracist. Alternatively, an antiracist white person who has done difficult, antiracist work for years or decades would appreciate the likely irreparable harm their publicly exposed, past racist actions have done to their credibility with black and nonblack people of color, and they would resign their position as an administrator, manager or elected or appointed office. There is no acceptable option under such circumstances for a white person who claims to be antiracist to stay in a position as a university administrator absent the strongest support among most black and nonblack students, staff and faculty of color. If this individual no longer has the respect of the most marginalized members of the Wake Forest community, then she ought to step down." Thornhill added that incidents like this are a reminder of how much predominantly white institutions have failed to adequately confront their histories and their present realities for black people, who are educated in places where fraternities with racist histories and powerful alumni are considered just a part of campus life. "Here is the part that most white administrators don’t get or are unwilling to acknowledge," he said. "Those of us on campus, and in society more broadly, who are committed to racial justice, see through the speciousness of pablum-like 'diversity and inclusion' rhetoric and related initiatives that lack substance, are implicitly gradualist in nature and are predicated on white comfort."